Archaeologists studying the Staffordshire Hoard have discovered that goldsmiths ‘cheated’ to make the the gold appear more pure and brilliant than it was. The research has been released today as the new dedicated Staffordshire Hoard Gallery at the Birmingham Museum opens to the public for the first time. And archeologists do not believe that this was an act of villainy or deception, to hide the impurity of the gold, but more likely a technique developed to improve and enhance the appearance of the item. In the largest study of its kind, which looked at 100 pieces from the Hoard as well as other Anglo-Saxon artefacts from Sutton Hoo and other finds, revealed that the gold content on the surface is significantly higher than that below - and therefore craftsmen had deliberately made the items appear more gold. The studies used both x-ray and scanning electron microscopy technology to analyse the artefacts - they found that the items were generally 70 to 75 per cent gold underneath, but 90 per cent plus on the surface. Lead archeologist on the project Chris Fern said: “They wanted to enhance the appearance, making the gold appear of as high a purity as they can. This was highly significant for them. He said the gold decorations were likely to be used by the 7th Century warrior elite as a sign of their status. His colleague Ellie Blakelock from the British Museum said it could be that the items were cast and then dipped in some sort of home made acid bath to remove the silver and copper from the surface. “It may have been a goldsmith’s trade secret,” she said. They also found that male items, such as belt buckles, had a higher gold content than female jewellery, and that shiny surfaces could be overlaid with darker less pure filigree wire-work to make the design stand out. Dr Ellen McAdam, Director of Birmingham Museums said: “The Staffordshire Hoard is that rare thing, an archaeological find that has captured the imaginations of both specialists and the public. • This is the largest study of its kind ever undertaken on Anglo-Saxon gold. The study analysed the metal content of the surface of objects, and compared this to the metal content below the surface. 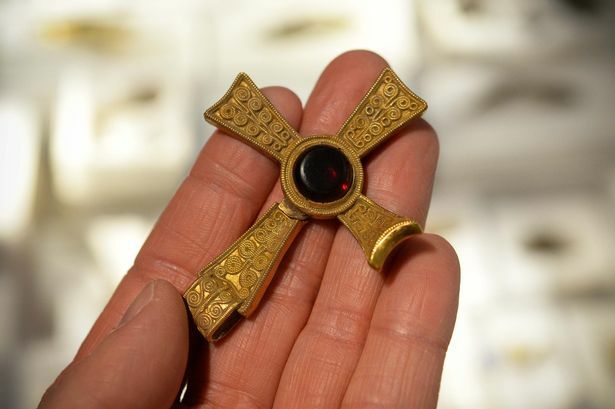 • The scientific analysis has revealed that Anglo-Saxon goldsmiths knew how to treat gold objects to improve their colour and make them appear ‘more gold’ by removing alloyed metals such as copper and silver from the surface of the objects. This is the first study to show this technique being widely used in the Anglo-Saxon period. • These results are of enormous significance to the study of the Anglo-Saxon period and beyond. They provide new insights into the metals used by Anglo-Saxon goldsmiths, and the techniques they used to create objects. They also provide confirmation that archaeological studies which rely on analysing the surface of objects to establish their gold content may be fundamentally flawed- not just for the Saxon period, but for all other historic periods too. • This is the first study to show extensive use of depletion techniques to improve the surface colour of Anglo-Saxon objects. Relatively little is known about Anglo-Saxon goldsmithing, but achieving this surface treatment would have been a skilled task, one we now know they were familiar with. However we still don’t know how they did it- it remains a secret, for now. But for the first time, we can begin to understand the choices the craftsmen made when selecting metals and treating the surface to achieve different colour effects. • The study appears to suggest that male items of personal adornment, such as buckles and clasps, were made with a higher gold content than female items, such as jewellery, and that the latter were instead more heavily surface treated to improve their colour. More research is needed to explore this fascinating insight hinted at by the study. • The research sheds fascinating light on the story of individual objects. Analysis of the five pieces that make up the seax hilt suite has shown that although four of them have a very similar metal composition and surface treatment, the pommel cap at the top is a different alloy and underwent no surface treatment. This strongly suggests that although stylistically and physically it fits the set well, it was possibly a later addition or replacement to the original weapon. • In the past, attempts have been made to date objects by their gold content, because previous research has suggested a general decline in the gold content of coinage in this period ― coins are thought to be the source of gold for making objects. However this decline cannot be seen in the objects in this study, suggesting new avenues of research may be needed.